Today I want to show you my new mod called Personal Cars. Currently it adds 5 types of cars (compact car, SUV, animal transporter, truck and a racecar), each available in 4 colors (green, red, blue and grey). What makes them personal is the fact that every car in the game has its own unique identifier and after crafting a car you need to pair a key with it. That means that only the key owner can open and close the car (when the car is open you can enter and drive it, otherwise you can just.. look at it and be jealous it's not yours, i guess? ). Each type of car has its own accelleration, maximum speed, health points amount and more. For some of these cars you can enter them with a passenger! Important Note #1: As of version 1.4 of the mod, you no longer can press R to start the engine. Instead, you need to right click the car's key while sitting inside it. Important Note #2: You have 2 drive modes available now. First (default) one is the simple one. It lets you instantly gain maximum speed of the car (like while driving horses or any other animals). The second mode (you can enable it using your config file) lets car gain and lose momentum while driving. This makes the car smoothly speed up/slow down and allows you to DRIFT using your handbrake (space bar). The realistic mode is still being worked on so it might not be what you desire (that's why right now the easy mode is set to default, this might be changed when i improve the steering). You need to place your car and right click with that clear key on it. Your key will get that car's identifier and they will be paired now. If you want to have more than just one key, you can craft a key modifier (recipe above) and place this key in first slot, a new (unpaired) key in the second and you will be able to use button "Copy" to copy key's identifier to the blank one. If you lose your car or just want to unpair a key to use it elsewhere, just put it in the first slot of key modifier's and press "Unpair" button. When your key is paired with a car, you can right click when you're close to that car to open/close it. When car's lights are turned off it, of course, means that the car is closed. When you open it, you can get in and start driving. To start the engine, right click your key while sitting inside the car. When the engine is running, you're ready to drive! You can also use horn (by pressing H, you can change this key binding as well) for fun or for scarying animals (animals get scared of car horn about once every 20 seconds). If the car is a truck, you can store items in it by pressing G while being inside the car (as passenger or driver). Transporters are vehicles capable of carrying any mobs you can use lead on. To get them in your car, unlock it, craft yourself a whip and get some leads. Use the leads on animals and right click the transporter with a whip to make them enter it. To make a single animal leave the car, left click the car with a whip. To make all animals leave, right click the car with a whip while sneaking or just lock it with a key (as locking the car always removes all of it's passengers). Compact car - can carry 2 passengers, achieves average speed and HP. SUV - can carry 2 passengers, doesn't sink and blow up easily in water, slower than compact car, has more HP. Racecar - can carry 1 person, moves quickly on surface, barely in the water. Transporter - not too fast and it's nearly 4 blocks wide, but it can transport any mobs you can use lead on. When you're transporting big animals, it can carry up to 6 of them, otherwise you can carry even 9 mobs! And yourself as a driver, of course. Truck - a resistant, big car that can carry 2 players and up to 36 (4x9) itemstacks. You can store items in trucks by pressing G inside them. Whip - required if you want to put your animals in a transporter. It also punishes animals if you right click them (it doesn't deal any damage, but makes mobs flee in panic). I hope you enjoy my work. Have fun! 1) I am not sure about this but is it registered in MC as a mob? as it does not break like a block; It does not do the "lie-down"death but it does require a sword to kill\break it most effectively. So could it work like the Traincraft trains where it breaks like a block (not needing a weapon and disappearing instantaneously in creative)? 2) Add fuel! like having petrol ore that needs to be refined with a refinery block (suggested recipe and fuel below) then load the car with a "Can/bucket of fuel"! 4) perhaps water for the radiator? without which the engine temperature skyrockets and the car blows up and leaves a crater. I might add: IT IS MY FAVORITE CAR MOD!!! 1) The cars are too fast. 2) The car's turning is terrible, much worse than a car in real life. This combined with the speed makes them impossible to control. 3) The cars are too wide. The "truck" for example is 3 meters wide. This means your roads have to be ridiculously wide to accommodate them. 4) The "truck" is not a truck, maybe a jeep. I translate it rapidly into Chinese,And let them to download here. Has the bug where you cant turn on cars in 1.12.2 been fixed? Read the note in mod's description. It does mention that the cars cannot be started by pressing R anymore. Just right click your key while being inside of the car. Yea srry apparently im blind. Can you fix the turn glitch? 'Cause every time I turn with every car, it glitches and lags. Other than that, the models and the idea is awesome! i really like this mod, is simple and effective, but the "truck" go SO FAST that it can't be drivable, is faster than the race car. It must be a bug. I'm using it on the minecraft 1.12.2. Is this compatible for 1.12.2? Yes, it should be working with MC 1.12.2. Let me know if there are any problems. Could you tag this as 1.12.1 and 1.12.2 compatible so that it's available in the Twitch app please? 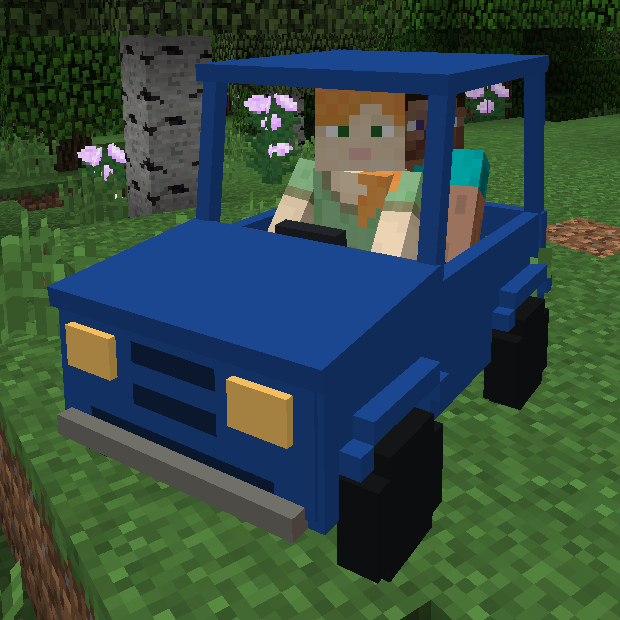 This is the best car mod I've seen in Minecraft, all the others were terribly glitchy.